Okay, I’m on a plane. Again. Why I do this to myself is beyond understanding. I can only blame Kristyn and Dawn for forcing me to go to BookExpo as I would never voluntarily stick needles in my eyes if I didn’t have to. I’m sick to my stomach. And no one even seems concerned about the grinding noise coming from the belly of this beast as we limp down the runway. Craig practically grabbed the torch out of this poor fellow's hand and said he would divorce me if I didn't put this picture in my blog. It’s only minutes into the flight and I’ve already had a few “misunderstandings” with my fellow companions. First, the sadist who doubles as a flight attendant informed me I can’t use my ipod during takeoff. Something about the possibility of messing up the flight signals. This makes no sense to me as every plan crash disaster movie I’ve ever seen has people using their cell phones to make their last call. Didn’t affect that flight, did it? I can’t speak for anyone else, but drugs and loud music help dull the panic and terror that frazzle my brain during take-off and landings. I’m not happy that I can’t lean on the Bee Gees in my time of need. Second, the check-in dude didn’t buy my argument that I should be moved to first class because, psychologically speaking, I believe I’m safer there. Seriously. So, I’m stuck in the high mortality section of this death trap where if I want a snack I have to sell a kidney to come up with the cash. 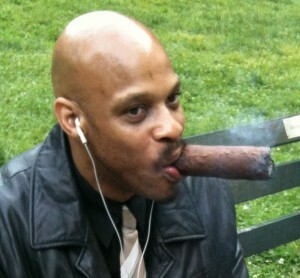 You think the cigar is fancy! You should have seen his shoes! Then, the woman in front of me, who is of the French persuasion by the way, (not that there’s anything wrong with that) threw her seat back and forced the tray table into my chest, where it figuratively, knocked the wind out of me. Don't believe NYC is safe! 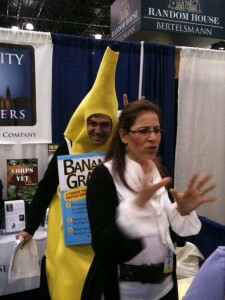 This banana was just about to grab Kristyn but he slipped away before anyone got hurt. Well, I held back from giving her another universal hand signal, but that didn’t stop me from groaning loudly, “Whatever,” in my best Valley Girl voice and kicking her chair every time I crossed my legs. The nerve of some people. The good news is I am sitting next to a very nice woman who has been overly polite and accommodating – as if she’s also afraid of something. I guess I’m not I the only nervous Nelly flyer. It gets worse. When I questioned the sadist, who has continually tried to ignore me, about the noise I heard during take-off, she claimed to have not noticed it. I don’ know how anyone could have missed the sonic boom that rocked the plane and rattled the windows. But what she told me next was so ridiculous I can only imagine it’s true. “No, seriously. When the landing gear comes down it sounds like dogs barking.” She didn’t smile or follow up with a, “Just kidding, I am high.” She just continued making her coffee. I figured her for the kind of person who makes fun of the handicapped. Not cool. Once again, Dawn steals the spotlight . So now the pilot tells me we’re only one hundred miles from NYC and the very spot that my personal hero, Sully Sullinberger, took out a gaggle of geese. Although when Matt Damon was a guest-star on Thirty Rock, he said that a really good pilot wouldn’t have hit those birds in the first place. Good point. I’m being told it’s time to turn off my device and start praying to whatever god will spare us. The sadists don’t use those exact words, but I know that’s what they mean. The craziest of them looks at me and mouths “listen for the dogs” as she cheerfully picks up the paper I have nervously shredded and tossed on the floor. I am certain I am headed for a fiery death. 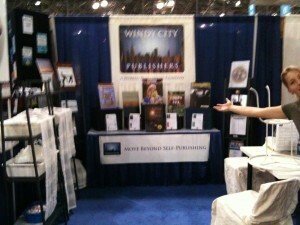 Local Chicago publisher hits the big time! “A real pleasure,” I repeated as I glanced over at Dawn, who was gently peeling a man’s very hairy hand from her arm. “Dawn,” I called out, “can I talk to you?” She looked at me gratefully as she made her way out of the corner in which she had been backed in to. We needed a code word. Here’s the dealio . . .
Situation analysis . 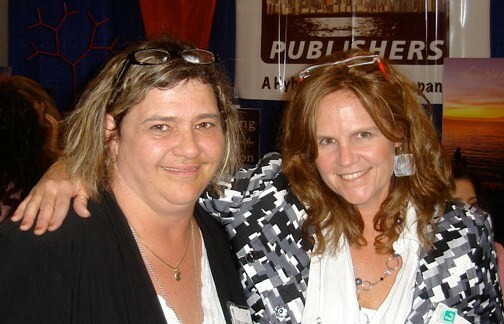 . . BEA – BookExpo America, the largest publishing conference in the U.S., New York City, May 2009. 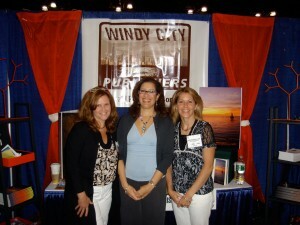 Windy City Publishers was making its debut and I, along with partners Dawn and Kristyn, was manning our booth on the convention floor. The lines to get in were long and we were crazy busy from the moment the doors opened and a brave librarian threw herself across the entrance threshold, determined to be the first to get Fabio’s autograph. No one had the heart to tell her the Harlequin icon hadn’t been there since 1995. Lise, Kristyn and Dawn - before the storm hit! Don’t judge us by our junk! Authors, publishers, book sellers, book buyers, librarians and anyone who was willing to pay the piper roamed the two floors of the large convention center. Our goal: to get as many of these fine folk to stop by our small 10 x 10 booth and listen to our pitch. The hook? Junk. Last January a local warehouse outlet store was going out of business and I struck a deal with the manager to take cases of the cheesy merchandise off her hands for, literally, pennies. The thought at the time was to hand out the Speed Racer tire gauges, rulers that said “girls rule”, gardening gloves (see above), Rubik’s cube erasers and a number of other “gifts” as bait to lure the folks hustling by into the WCP booth. 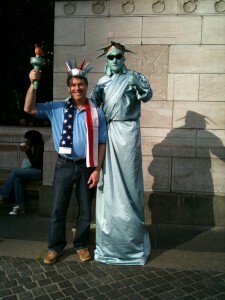 My argument did not convince them and we struck a deal. I had one hour after the show opened to make my case. If the gifts did not perform as I expected, the Ice Age II bouncy balls and Harry Potter stickers, along with the other treasures, would be pulled and stored behind closed doors. We could then join the ranks of the sophisticated other vendors who were above such nonsense and hopefully Windy City Publishers would have enough time to earn back the respectability that such a stunt might damage. Dawn was so confident they were right, she offered to kiss a certain large part of my anatomy for a year if I was proved wrong, and Kristyn joined in the bet, both women convinced that I had relapsed and the bizarre voices in my head had returned. It could have been the fact that I stood in the aisles shouting “free stuff” or that I practically stalked the patrons walking by, but within minutes it became obvious that the pink lava pens were a hit. Say it with me, friends . . . we like free junk! I know I’ll take anything (two if it’s small) of whatever you want to give me, even if I have no need for it, no place to store it or don’t even know what it is. I actually bought 1500 of the Rubik’s erasers, knowing that I would have at least one item for birthday gift bags for all the foreseeable future. But people pushed into our booth, jockeying for position. We overheard librarians claiming that we gave out the best chotchkies and they would pass on our location to their friends. The booth was busting at the seams, folks spilled out into the asles and we couldn’t keep up with the crowds. We did manage to spread the good word of our company and collected hundreds of business cards in addition to talking non-stop for three days. We met some really great people (hi to Ray, Barbara and Peter) and some really interesting people (translation: strange). Check out one of our BEA featured authors, Christine Sandor (This is Not Goodbye). She gives a glowing review of WCP in her brief video - and we didn't have to pay or threaten her to do it. Bonus! I’m not one to rub it in, but WCP was the buzz of BEA, partially because of our swag, partially because of the scantily dressed models we had hanging out (I’m just pulling your leg – Kelly and Leslie aren’t models). I may slightly exaggerate, but we were very popular. The “gifts” proved to be excellent bait, and I’m happy to report I have a year of special lovin’ coming my way from two of my very favorite people (That would be you, Dawn and Kristyn). Now if anyone is interested in a Rubik’s cube eraser – have I got a deal for you! A special thanks to our good friend and design expert, Jeff Comeau, (IntuitDesign) for all his hard work, on both his design work and his manual labor at the show. P.S. Jeff, my leg is fine, the bruises have healed nicely!